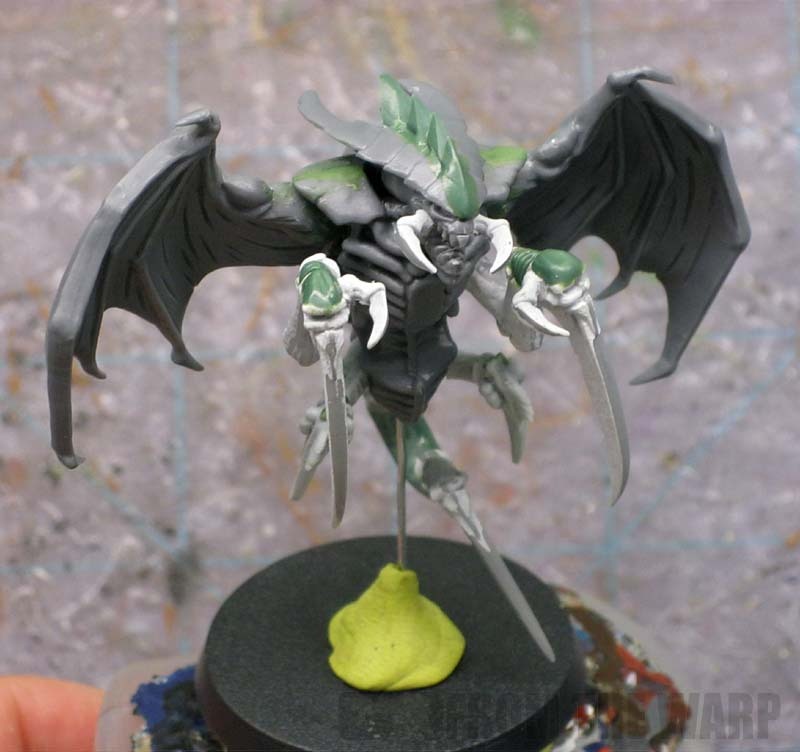 It's not often that I get a chance to tackle a Tyranid model, but this project was done for a friend of mine in our local gaming group who plays Tyranids. He runs a Parasite of Mortrex and I offered to see what I could do with converting one up for him. This is only my second "bug," my first one being the Spore Mine thingy I built from scratch. I had hoped I would have some leeway here like I did with the previous model and the organic nature of the figure, but this one proved to be a little more challenging. I tried to keep this one like the artwork in the book or at least as close as I could get to it. Some smaller elements were left off and certain things were added because I thought they helped convey the overall feeling of the image. Let's see if I can explain some of my thinking behind the construction of this guy. I kept him about the size of a Warrior based on what the info in the codex said. I didn't want him to be super big, just big enough to be a credible threat. I bought a Warrior body thinking it would make the perfect starting point for scale. 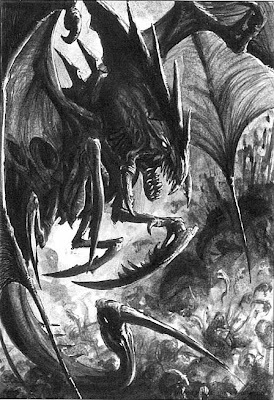 For the wings, I opted to use a set of Chaos Possessed wings. The wings were a bit of gamble since I was afraid they were going to be too small in the end. Turns out, they are the perfect size for this model. Much bigger and the wings start to become the focus since they'd be the dominant feature. My initial plan was to mount a wing and then three arms in each of the three sockets on each side of the torso. Then I got to looking at the artwork and it looks more like he only has two arms on each side. This allowed me to use the top socket as the attachment point for the wings. A little bit of greentuff around the joints and I was set there. The only other conversion I did to the arms was to modify the upper set by bending them back more as though he was flying and then moving the thumb claw over to the side of the wrist instead of on top. 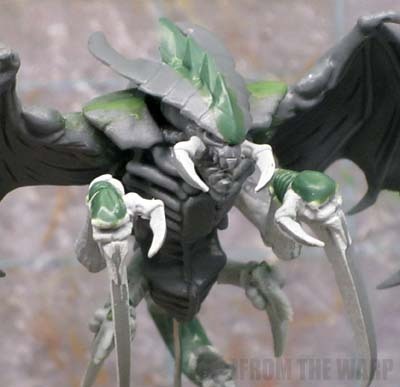 It's a small thing, but I think it helps with the overall look of the model as most folks recognize the thumb claw as being on top with most Tyranid models. I opted to do some things to the head of the model as well to try and set him apart from the other Warriors in the army with similar heads. I added the fangs to the sides of his jaw and then sculpted a huge ridge of greenstuff along the top. I let that cure and then cut out a series of spikes from it. I figured that would mimic the artwork and really help set him aside as different. I also added a few spikes down his back for good measure. It sort of helps tie the body in with the head once I added the spikes on there. The tail was a huge challenge for me. 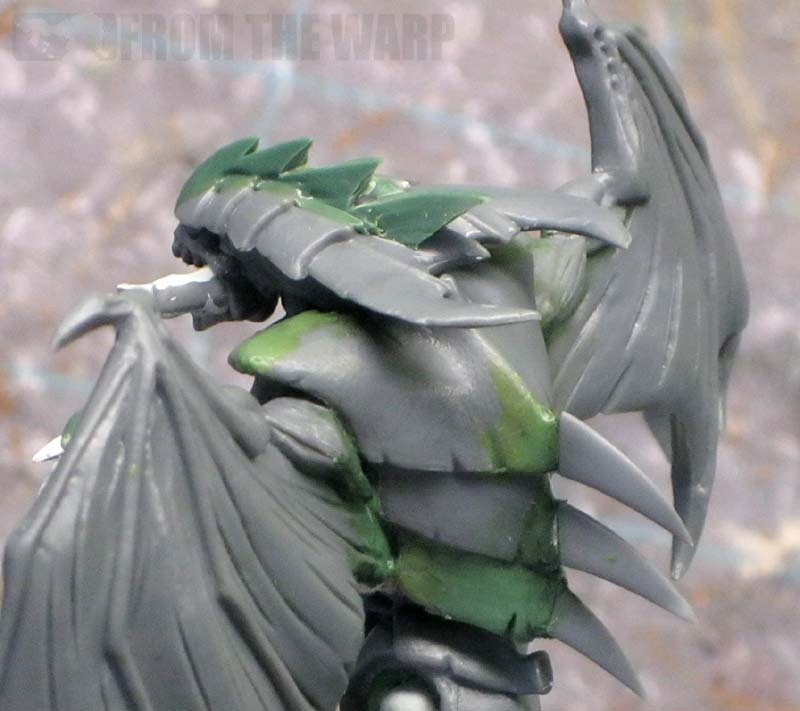 It can be very difficult to sculpt a tail on a creature without it looking like a poorly shaped greenstuff log. I tried to blend it into the spike at the end and the torso at the other end. I was very careful to watch the thickness of the tail overall and then add some texture to is so that it blended in with the musculature of the creature. The key is making it blend in overall. I think I came close enough here that with a little bit of paint, it will appear as though it's not a conversion and part of the model as it should be. 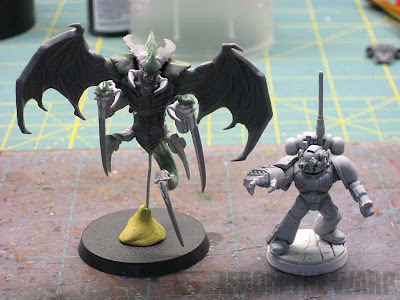 And here's one last look at him compared to a Space Marine for comparison. Not too bad... looks like a flying Warrior I guess. 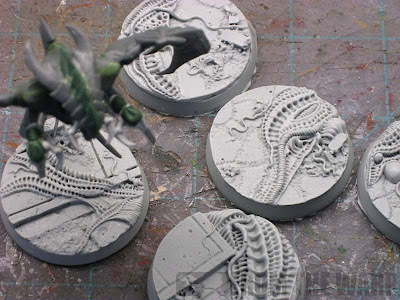 He's going to be mounted on a killer base to help the illusion. I'm using one of the Urban Invasion bases from Secret Weapon minis. 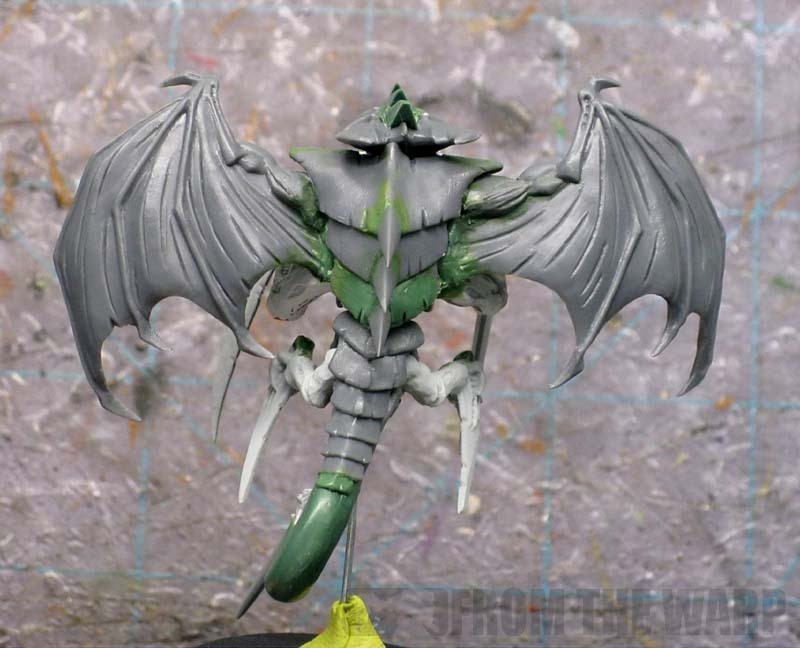 I used one on my Spore Mine model and the combination of the urban rubble base with the Tyranid like tendrils creeping over it is perfect for this guy. Once I get the paint scheme from my friend, I'll get him painted up and post pics of the completed model. As always mate, incredible work! Great work. You have really captured the feel of the parasite. Great conversion, amazing how you were able to keep the design so close to the concept art. Narric: I see what you mean. Hopefully the transition will be a bit smoother once they are painted. Nice work! I wish I could get Greenstuff to go as smooth as you do! used a warrior body, the old ravenor head and arms, a chuppa chup stick for the hollowed out spike on the tail, venom sacks from a carnifex for the ripper larva sacks, and warrior wings from forgeworld.